Like many of you, I want to reduce pollution from fossil fuels. Among various conservation and efficiency measures, I've also considered installing solar electricity panels at my house. However, my housing situation and finances just don't allow it right now. That's why I'm very excited to explain a new way for Minnesotans to buy solar electricity--through a subscription to a community solar garden. What is a community solar garden? 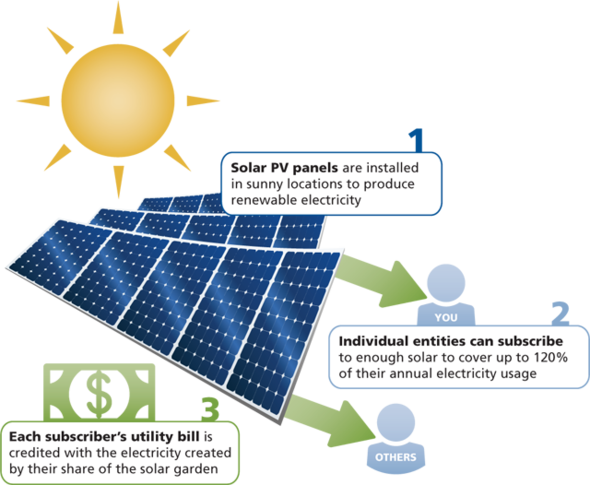 A community solar garden is a centrally located solar system that provides power to participating subscribers. Participants can buy as little as 200 watts or up to 120% of their annual electricity usage. Subscribers get credited on their electricity bill for the electricity created by their share. Community solar gardens make it easier for people to generate their own solar power because they tend to be cheaper and more practical than mounting personal arrays on individual rooftops. It also makes solar accessible to people who live in an apartment or have a shaded roof. There are different Community Solar Garden models. Some have up-front subscription fees while others are “pay as you go,” with a monthly or periodic fee. Why are community solar gardens being developed now? In 2013 Minnesota passed a law that required Xcel Energy to develop guidelines for community solar gardens. With those guidelines in place, solar developers can find sites in Xcel Energy territory, build projects, and open them to local subscribers. Other utilities decided that they would create community solar gardens programs, too. Start by looking at the list of existing projects on the Clean Energy Resource Teams website. You can sign on if you are a customer/member of a utility and live in the same county where a project is located or an adjacent county. Though the list of projects will continue to grow, you don’t need to wait passively for one to arrive near you. The great opportunity with community solar gardens is that anyone, or any group, can come together to kick-start a project. A congregation, a local government, a school, a community group or any group of customers can find a developer and come together to develop a community solar garden. Clean Energy Resource Teams can help a group get started. David Schmidt is a research engineer at the University of Minnesota and participates in the Wright-Hennepin Cooperative Electric Association project. Clean Energy Research Teams recently interviewed David about his experience as a solar garden subscriber. David had already cut back on his energy use at his home in Corcoran, Minn., and converted to LED lights. For a long time, he was intrigued by the idea of generating power from the sun, but had never taken the next step—until community solar came along. "I just purchased one panel, as that was the right price for me at the time," David explains. "My plan is to purchase one panel per year." His 190-watt panel was about $900. The panel is producing between 5 and 20 kWh/month. Visit the CERTs blog to read more about David's experience. CERTs 2015 will be an exploration and celebration of successful energy efficiency and renewable energy projects, and a coming together of hundreds of amazing people who are working to create a clean energy future in their communities and beyond., March 10-11 (St. Cloud). A homeowner looking to learn more about a home solar installation might enjoy the Minnesota Renewable Energy Society's upcoming class, Solar Photovoltaics 101, February 28, 9 a.m.-4 p.m., Century College (White Bear Lake). Exhibits about climate and energy issues are visiting the Headwaters Science Center, downtown Bemidji, from January 31 to June 15, 2015. Area residents can explore home energy use, Minnesota’s changing climate, and actions to reduce, adapt and prepare for climate change. Join representatives from the Minnestoa Pollution Control Agency, Minnesota Department of Commerce, Bemidji State University Sustainability Office, Rural Renewable Energy Alliance (RREAL), and Otter Tail Power Company for the opening day, January 31st, 10 a.m.-2 p.m., Headwaters Science Center (Bemidji).